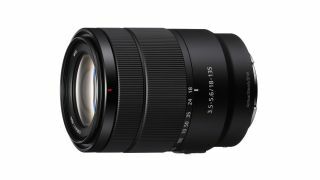 Sony has added the E 18-135mm F3.5-5.6 OSS to its lens portfolio. This new lens, which is the 46th of its kind for Sony’s E-mount, is designed for APS-C bodies such as the A6000 and A6300, and features Optical SteadyShot stabilisation to help keep images sharp and videos stable. It's 325g weight complements the light weight of the aforementioned models, while its 67.2x88mm dimensions make it particularly compact when you consider its generous 7.5x zoom range, which spans 27-202.5mm in 35mm equivalent terms. It matches up well with the already compact A6000-series cameras to make a tempting choice for anyone looking for the best travel camera right now. The internal design features one aspherical and two extra-low dispersion elements in order to minimise aberrations, and Sony says the optical design should ensure corner-to-corner sharpness throughout the zoom range. It also carries a maximum magnification ratio of 0.29x and a minimum focus distance of 45cm, while a seven-bladed aperture is on hand to ensure pleasing bokeh. A linear motor housed within the lens is said to ensure fast and precise autofocus, further complementing the a6000-series of mirrorless cameras, which place an emphasis on speed. The motor should also ensure the lens finds focus quietly, which should be useful for those intending to use it for video recording. The new lens, whose official name is SEL18135, will be available from February 2018, priced at around £570/$599. Pricing for other territories has not been confirmed as of yet. Head to Sony’s official website for more information.